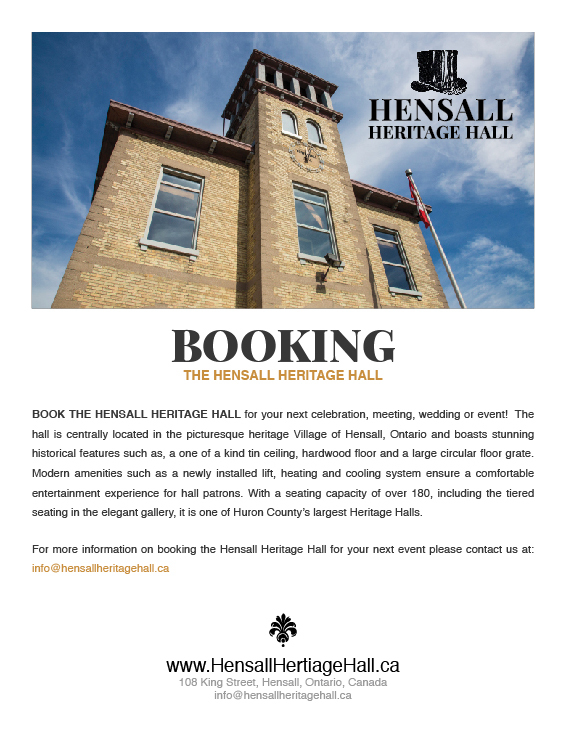 The Hensall Heritage Hall is a unique venue, ideal for theatre, dances, weddings, parties, meetings and more. The hall boasts stunning historical features such as a one of a kind tin ceiling, hardwood floor and a large circular floor grate. Modern amenities such as a newly installed lift, heating and cooling system ensure a comfortable entertainment experience for hall patrons. The spacious interior seats 200, including tiered seating in the elegant gallery. Discover the Hensall Heritage Hall, where the charm of yesteryear and the best times of your life meet.